April showers never happened, and now here we are in beautiful May. The strawberries in the store aren't quite in season yet, but that doesn't mean I'm not in the mood for a nice fresh berry kick. 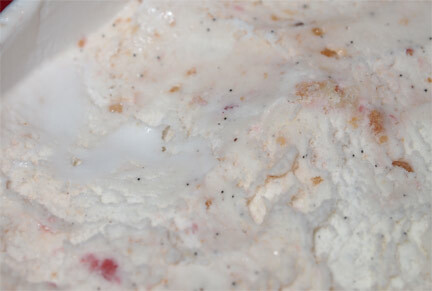 This is New Orleans Ponchatoula Strawberry Ice Cream. 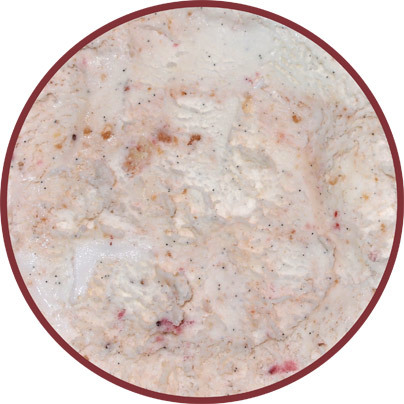 "A smooth and creamy strawberry ice cream bursting with the freshest Ponchatoula strawberries". I do love strawberry ice cream! You know, now that I think about it, you don't really see a lot of strawberry swirl flavors nowadays. I can't even bring one to mind... well, there was Starbucks Strawberries & Cream a few years back. 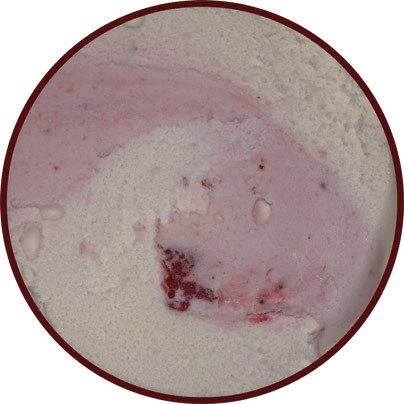 This one is a white vanilla/cream flavored base ice cream (no bean specks) swirled with a sweet pink strawberries ice cream with big strawberry chunks mixed in. Now when I say sweet, I do mean sweet, so you'll want to get a mix of both flavors on your spoon to make sure you get a nice balance. This is definitely the sweet dessert version of your typical strawberry ice cream. 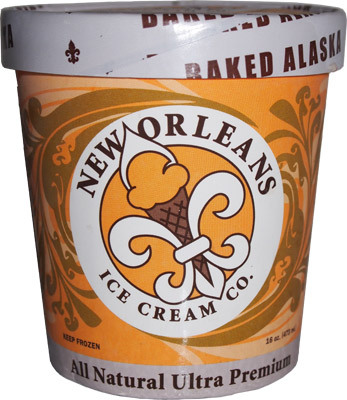 Do we really expect anything less from New Orleans Ice Cream Company? 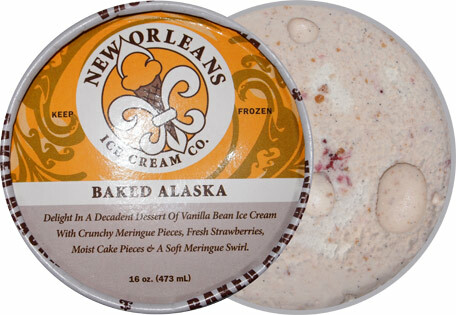 This is New Orleans Baked Alaska ice cream. "Delight in a decadent dessert of vanilla bean ice cream with crunchy meringue pieces, fresh strawberries, moist cake pieces & a soft meringue swirl". Wait, there is crunchy meringue as well as soft meringue? I just learned something new! A take a few small bites and I'm hooked. I am dazzled by vanilla bean bits, meringue bits, and a subtle strawberry flavor that ties everything together wonderfully. The strawberry is more natural and less sweet than in the Ponchatoula. Plus not only is the vanilla and strawberry more balanced, but we've added in a little meringue crunch to grit things up and give us a true dessert, not just an ice cream. Oh sure, it's still intense, but this one is so much more my style. It's just wonderfully complete. 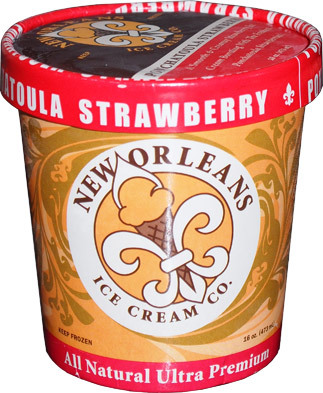 I think I might have a new favorite New Orleans flavor, it's just that wonderful Actually, this might be my new favorite strawberry flavor in general. It's giving strawberries the respect they deserve. The strawberry bits are tiny which is totally the way to go here. I just don't want to ruin the overall texture with a icy frozen fruit thud right now. Instead I've got this lovely crumb crunch here and there. Oh I love my gritty swirls, I wish there was more! (note: on occasion you do get a ball of moist cake, but it's the meringue grit that I love). This is such an awesome looking ice cream. Hehehe, I just noticed the meringue swirl on the left there. I was trying to set up the photo and I'm like "what's this shiny white spot?". I taste the swirl and it makes me want more crunchy bits. It's soft, gooey, intense, and very unique. Ok, I need to stop. I totally recommend nice small bites on this one. Scoop, savor, repeat. On Second Scoop: Ok, I've calmed down now and going back in to a second serving that has way more meringue swirl than my first serving. Yeah, this one is really sweet. I love the base, love the crunchy bits, and I very much enjoy the swirl, but all together they are pushing the bounds of sweetness. This is such a fun unique flavor that everyone should try, but I wouldn't be me if I didn't warn you about the intensity of it all. On Third Scoop: Just for clarification, I really really really like this flavor. The only disclaimer I put on this one is that you shouldn't start your scooping with the meringue. It'll throw you off too much. Such an awesome flavor, I loved it, and now I'm so very sad it's gone. Okay, I think I need to finally bust into my pint I order awhile back.